Browser add-ons are a great, but not everybody uses them. If you want to build a serious Web business, it is probably still a good idea to have a Website as well. Last year, when Tom Romary launched Yapta he didn’t want to compete with all the other established travel Websites out there. 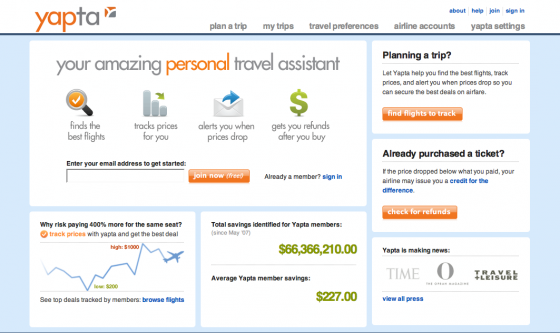 So he created Yapta as a browser add-on that allowed travelers to track flight fares at the exact time when they were searching other travel sites for airfares. (See our initial review here). Now, 350,000 registered users later, Yapta has finally launched as a full-fledged Website, where you can track fares from 23 different airlines, including American, Delta, United, Jet Blue, Virgin America, and many newly added international carriers (Air France, British Airways, Cathay Pacific, Lufthansa). 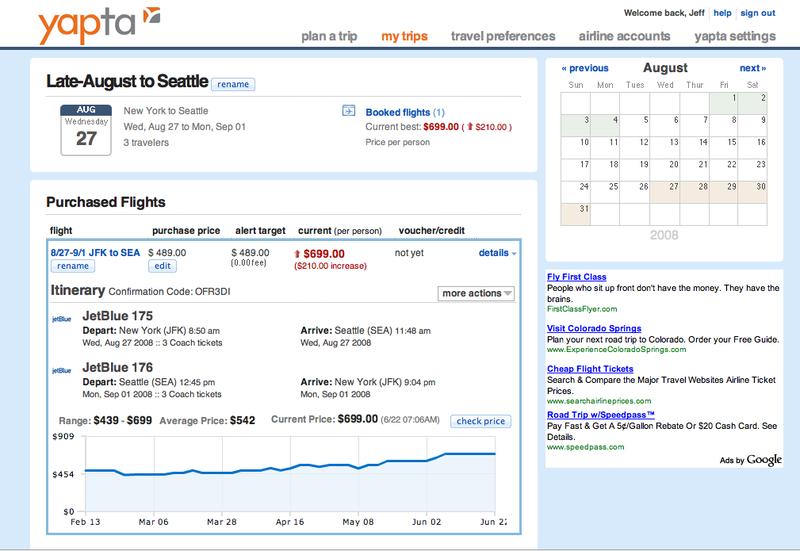 Once you find a flight you like, you can track it, and Yapta will alert you when the price drops. 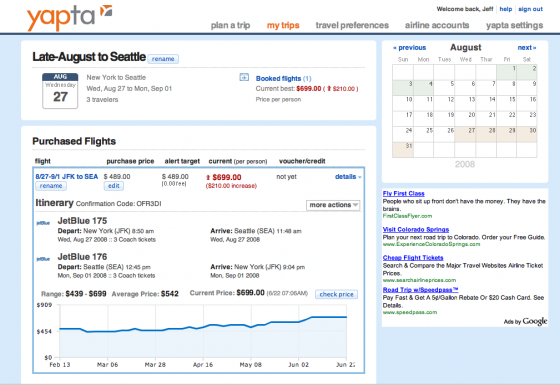 If the price declines after you purchase it, Yapta will help you get a refund or credit from airlines that have lowest guaranteed fare policies (most of them do if you buy directly from the airline, which Yapta helps you do by linking directly to the airline sites). Prices are very volatile. What we’ve learned is that the answer to whether it is going up or down is. ‘Yes.’ It is going up and down. People want to know when it happens. 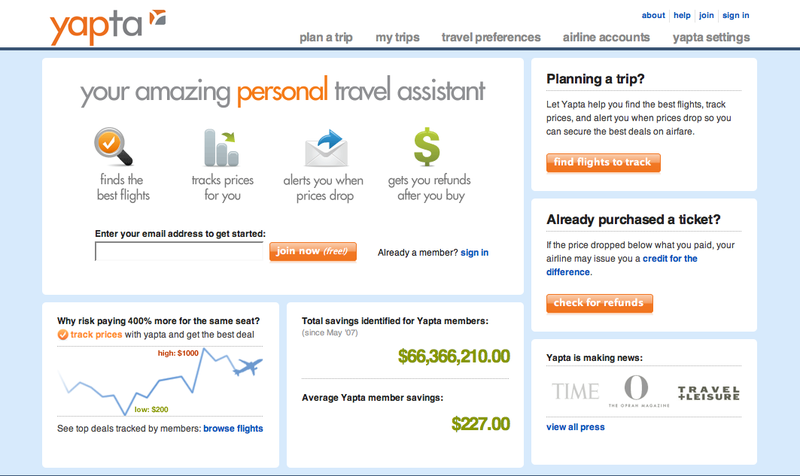 So far, with just its browser add-on, Yapta users have tracked more than one million flights and identified over $60 million in savings. Nearly $50 million of that was identified before purchase, and the rest came in the form of vouchers from the airlines after the fact. Of all the flights tracked, about half (46 percent) saw price drops. Now that Yapta is a Website, maybe it will be able to grow beyond the niche that it has carved out for itself. If you have time to plan a trip a few weeks out in advance, Yapta can be really handy, especially in conjunction with Farecast which gives you an idea of how low prices on a particular flight might go. Too bad there isn’t an API for Farecast that lets Yapta integrate the prediction feature into its own site, or vice versa.